Mr. Sellner, Team Leader of the project “Development of Common Security Management System and Cooperation in the Area of Maritime Safety and Ship Pollution Prevention for the Black Sea and the Caspian Sea” informed on tasks and objectives of the forthcoming Regional Working Group meeting to be held on April, in Odessa, Ukraine. Within the framework of the meeting the experts emphasized the importance of preparation of final draft version of the Regional Action Strategy on Maritime Safety, Security and Environmental protection in line with International Conventions and regulations to be used in the MLA Parties in the future. The developed document within the framework of the EU funded SASEPOL project is fully complies with the tasks and objectives of the Strategy of the IGC TRACECA for the development of international transport corridor Europe-Caucasus-Asia for the period up to 2015 and is designed for use as a guidance document as a guiding document for the Regional Working Group (RWG). 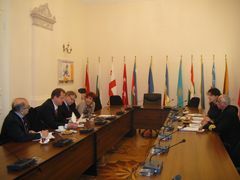 During the discussions experts of the Permanent Secretariat commented on the usefulness of the participation of representatives of the Republic of Moldova in the activities of the Regional Working Group (RWG), which would make possible to expand the geography of the project insuring for maritime safety and environmental protection and to improve regional cooperation in this field, and which undoubtedly complies with aims and objectives of the IGC TRACECA and the European policy on maritime security. Mr. Sellner also discussed the status of the project as well as the involvement of national structures ensuring safety at the sea with Mr. Akif Mustafayev, National Secretary of the Republic of Azerbaijan.